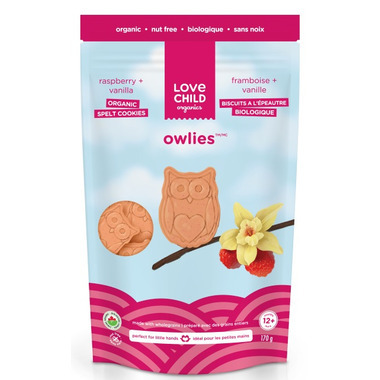 These Owlies are made with spelt (which is known to be easier to digest than wheat) and have a simple, easy-to-understand ingredient list. A yummy little treat for your littles. Whoo-Whoo, wants an Owlie? Ingredients: Organic whole spelt flour, organic evaporated cane juice, filtered water, organic palm oil (sustainable), organic sunflower oil, organic dried raspberry, organic vanilla extract, sodium bicarbonate, sea salt. Contains: Gluten. May contain: Soy, egg. by an adult to reduce the risk of choking. My 18-month-old granddaughter loved these, and my daughter-in-law was pleased with the ingredients. I'll definitely be buying more of these! Both of my children have loved these as babies. Decent amount in package. Will continue to buy. Nice treat. Could use more nutritional value. Easily dissolves in babies mouth. Will buy again. Super tasty and great alternative for vegans as the other commercial snack cookies have all sorts of not-so-great ingredients in them. These are pretty yummy, and a good size for toddlers. Same review as many of the others - my son goes bananas for these, he absolutely loves them. I also think the sweet potato ginger ones are slightly addictive! I feel better about giving them to my son than a regular cookie, but I did think that the fruit/veg combo in them would provide more nutritional value than is actually present. It's a bit deceptive, so definitely worth reading the nutrition facts before purchasing. These are delicious snacks for my toddler and myself! Too bad they didn't have more nutrional value to them or I would give them to her more often. Great taste though and organic which is a huge plus.